the depletion of an additive package may cause an initial decrease in TAN of fresh oil. However, the accumulation of oxidation by-products and acidic contaminants in an oil over time will always lead to an increase in TAN. 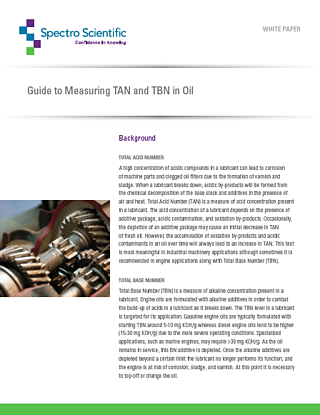 This test is most meaningful in industrial machinery applications although sometimes it is recommended in engine applications along with Total Base Number (TBN). remains in service, this BN additive is depleted. Once the alkaline additives are depleted beyond a certain limit the lubricant no longer performs its function, and the engine is at risk of corrosion, sludge, and varnish. At this point it is necessary to top-off or change the oil.